Habitat: The plant is native to the temperate regions of Europe. It prefers limestone soils. 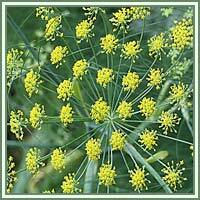 Description: Fennel is a perennial, umbelliferous plant. It has thick, white rootstalk and hollow, striated stems. Leaves are feathery, deeply cut, alternate and triply pinnate. Flowers are yellow, produced in large terminal umbels. The plant flowers from July to September. Useful components: Trans-anethole, fenchone, essential oil, organic acids, flavonoids, tannins polysaccharides. 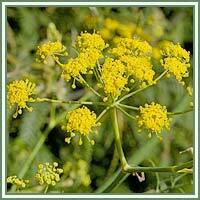 Medicinal use: Fennel is most commonly used in treatments of gastrointestinal disorders. It has shown to be extremely helpful in relievement of abdominal cramps, gas, indigestion and bloating. It is very successful as an appetite suppressant. Fennel extracts are known to have estrogenic properties, and therefore are very helpful in coping with hormonal imbalances caused by menopause. Due to its calming effect, it can also be included in treatments of asthma, coughs and bronchitis.